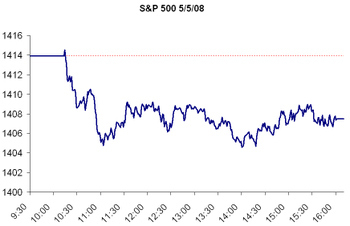 Those traders active in the market yesterday may have noticed that the S&P 500 did not open on time. In fact, it was not priced yesterday until about 10:14 am. Birinyi Associates has been concerned with systematic changes in modern financial markets, but more important is the lack of concern from the larger investment community. There is no mention of the glitch in today's news, and the only explanation we found was that it related to a problem at the CBOE. We stress that the inability to calculate the US market's most closely followed benchmark should be a cause for concern, especially considering the fact that nearly all trades are executed electronically (we all see the NYSE floor on CNBC every day). Readers interested in more information may also be interested in subscribing to Birinyi's Mini-Institutional service. In August 2007, Laszlo Birinyi published a report to those subscribers entitled "the next CRASH," which wasn't necessarily a bearish publication, but detailed many examples of systemic failures and their possible impact on the greater market. We continue to cite examples of these failures, and must ask not if but when the next "glitch" will be more than just a confined error.